Poor Alex, ever wonder why he has to fly alone so much? Well, our windows are getting smaller all the time, and you have to be right there when it opens. If not, it slams shut. When you live a minute from the most prolific launch site on the island, catching these windows is a tad bit easier. Oh, and he has a lot of free time on his hands. He is presently #1 in the USA for most air time logged on Leonardo this year, and #5 in the world. Today, I got to be there right when it all happened, and I just about got my fingers snapped when the window was closed. I headed out to Kahana early to see Woody about a new harness, and to visit with his much better half, Nancy. I got there, but they weren't. Apparently they were testing out a new car for Nancy and were at my house. Figures. Alex sent me a text stating that he and Jeff were picking some fruit at the ranch. It wasn't flyable, apparently. I joined them over there and we had fun picking star fruit, bread fruit and figs. Alex set out some farm fresh eggs for Jeff to take as well. When our back was turned, Kui, the sneaky dog, ate all but two. We were catching each other looking up at the clouds. It wasn't happening. Island wide, sensors confirmed it, but we kept looking. Hunger set in, so we headed to Ken's Fish, a fisherman that sells fish out of his carport, and makes the hugest bestest plates ever. $10.00 and you could split it, but we didn't, and didn't finish it. Alex put the leftovers in the fridge and looked up at the sky again, frowned, turned back to the fridge and relieved it of one Torpedo. I was tempted but somehow refrained. We walked through the woods inspecting the acreage and I could actually smell that beer. Thanks Alex. But wait! He was upwind in the right direction and I was smelling that beer. We bee lined it to the LZ where Alex, of course, called it perfect. Marginally speaking of course. Even a sledder injection would have sufficed. But as Alex's luck would have it, launch was perfect. A tad east, but perfect none the less. We tried a few bay crossings. Alex was in the lead on the first attempt. I was much higher and jinxed myself by saying, I got this. Alex didn't make it, and he was low with no chance of Swanzy's. I saw what was happening, and hightailed it back towards launch. I looked below me and he made it back, but he was low. We tried a second time, and Alex scratched up at Hidden Valley and then disappeared toward Kualoa, but I just couldn't make it work, and limped back to launch. I gave it one more try, then turned back to go land. There was a bit of texture on the water but it looked doable. 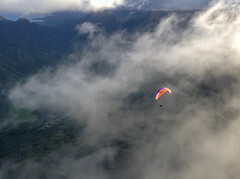 Alex looked on from high above Kaaawa as I zeroed into land. I could see a waft of texture coming my way and braced myself for some gnarly rotor. It was a little pitchy but I survived it and landed safely. I advised Alex to change the channel and head to Swanzy's. It's Time to Fly, Get Your Gear or Broomstick and Go!! !